Drip Water Irrigation - Is It Appropriate For Your Garden? Drip Water Irrigation – Is It Appropriate For Your Garden? I’ve talked about the problems of drip water irrigation before and today I’ll talk about what you should use instead. Why Does Everyone Say to Use Drip Water Irrigation? It is rare to find criticisms of drip water irrigation other than that they are expensive or that they clog up. Even most of the “Save the Water” non-profits and government organizations push drip irrigation quite heavily. Saving water is a very serious issue and I don’t make light of that at all. It’s become quite hip as part of the whole green and organic gardening movements, which is a good thing. The problem is that these organizations are focusing on their own problem without thinking about the whole system, kind of a scientific reductionism. Water conservation is important, but it must be done in the context of everything else. Is Drip Water Irrigation Ever Appropriate? Drip water irrigation can be used for certain things. 1. Containers. It can be used to water containers, which often need water every day. This saves time, but not necessarily water because enough water has to go out to water the thirstiest plants in the hottest locations in your organic garden, while other plants will get overwatered. That means you really have to plan well and use different lines where you have plants with different needs. 2. Vegetable Garden. It can be useful in a vegetable garden if it’s not too big. If you have a big garden, drip irrigation uses a lot of hose if done properly, because it needs to be laid out to water the whole soil. Same with soaker hoses. But in raised beds, for example, it can work well. 3. Thirsty Plants. Drip can also be useful to give additional water to certain plants in a landscape that need more water than everything else. In this case, the regular microspray or sprinkler irrigation system can water until the rest of the plants and soil are properly watered and the drip water irrigation can continue for those thirsty plants. This would save water while giving the proper amount of water to the entire garden. More appropriately, plants with similar water requirements could be planted together, an organic gardening design issue. Which Irrigation Method Should You Use For Most Of The Garden? 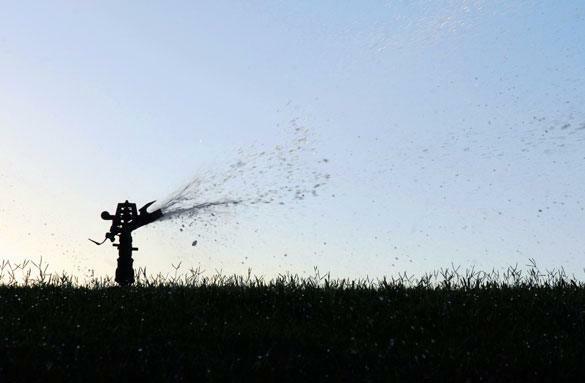 You can irrigate with anything that provides water to the entire landscape: by hand, with a sprinkler, microspray heads, or even soaker hoses if they overlap enough, although the latter really only has occasional usefulness. Drip water irrigation was designed for food-growing monocultures in dry climates in order to save water and chemical fertilizer. It still has applications there, and occasionally in our gardens, but rarely is it appropriate in our ornamental gardens. When organic gardening, our entire gardens need water, including the whole soil. They need to be watered deeply and infrequently so the roots of our plants will search further for water and nutrients, and so the insects and microbes have water, too. One of the best posts ever and confirms so much of what I’ve expected for a long time. I’ve been very successfully practicing “dry gardening” for several years by spacing my plants well, mulching heavily and watering occasionally to encourage the roots to go down vs stay at the surface. my plants can thrive for 3x as long as my neighbors on a fraction of the water. Better for the earth, better for my schedule! I live in Tucson, AZ and am growing vegetables in a small raised garden. In my situation would you still reccomend a sprinkler over the drip system? Hi Nicki, it’s definitely possible for drip irrigation to work in a small raised bed, and is more suitable for your climate. The main goal is to make sure the whole soil gets watered deeply, not just the area right around each plant. Hi Phil,I have a question about using Molasses as a bio-stimulant for my garden. I recentlypurchased a 1 gallon container of molasses to use in my garden but I neglected toread the ingrediants before buying and much to my chagrin it has phosphoric acid as the only ingrediant besides molasses. Can I still use the product in my “organic” garden? Thanks.Jeff B.
Hi Jeff, I tend to be a fairly organic guy, and I haven’t had any kind of cola for years, partially because of the phosphoric acid that demineralizes us and eats away at our bodies……but the truth is that a tiny amount of phosphoric acid is generally good for the garden, so go ahead and use it. I probably wouldn’t use it to brew compost tea, but your garden will like it very much. Hi Ellen, soaker hoses can be useful in a small area to establish young plants.But in order to get the whole soil wet, which is important because we need to provide water for all of the organisms in the garden, it often requires an awful lot of hoses, which gets expensive and messy. And they also aren’t good for getting the mulch wet, which is important for the organisms that live there. Phil, my tomatoes split near the stems. I’ve read that this is from inconsistent watering. I water them every morning with a hose. Near year, would a soaker hose end that problem? Hi Donna it sounds like you’re watering plenty already. It could be a nutrition problem. Some things that could help are: topdressing with good compost, mulching, applying sea minerals, and applying EM or compost tea. In the long run, you would ideally get a soil test done and then apply the appropriate minerals to balance out your soil, plus improve the organic matter content. love all the information, I have been a professional organic gardener for eight plus years and in to fairness to drip irrigation, the information above is completely wrong: “Drip water irrigation can be used to water containers, which often need water every day. This saves time, but not necessarily water because enough water has to go out to water the thirstiest plants in the hottest locations in your organic garden, while other plants will get overwatered”I dont know even where to start, so ill keep it basic, pots do need water sometime three times a day , but that in no way means that the rest of the garden will be watered three times. Containers require a seperate watering schedule which means they require their own valve and program. Each hydrozone within a garden constitutes it own valve . You dont water a veggie bed the same way you water mature fruit trees. Another erroneous point was made how drip irrigation only waters the surface. This information is wrong and irresponsible. The whole point of drip irrigation is to avoid water loss and ensure plants recieve optimal moisture. I agree, plants want deep infrequently water which is so easily achieve by simply programming the timer for longer run times less often, shockingly simple. While hand watering deeply is great, how much is lost to run off, how much to evaporation, how much drains away when root mass has is capacity to hold water is at 100%? Hi Kevin, good point about the containers. This post is actually a summary of a longer article I had written, and some of my points were lost. I forget the whole context, but I agree, drip can be great for containers, and of course they will have their own valve. But if you have containers in sun and containers in shade, and containers with plants of different water needs, you will end up overwatering some unless you put them on several different hoses.It can be useful for some small vegetable gardens, too. A well-designed system can water deeply and widely and infrequently and get the whole soil, which is key.When it becomes misused is when it’s put into a big ornamental or vegetable garden to water the plants, including shrubs and trees. My main point in the original article was that the whole soil needs to be watered, not just the plants.I agree with you that the whole point of drip is to avoid water loss and ensure plants receive optimal moisture. But that’s also how landscapes are destroyed, because we focus too much on the plants and we forget about the soil. (incidentally, evaporation and run off are negligible with hand watering if done properly). I’ve seen so many expensive yet poorly installed drip systems were the soil is not being watered and salts are not being flushed out of the root zone.But thanks very much for your comments. I’m going to do a little tidying of this post.